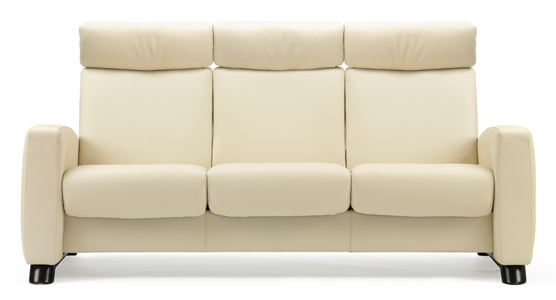 The Stressless Arion sofa is one of the most stylish and comfortable sofas Ekornes makes. The Arion delivers all of the comfort you would expect from Stressless with timeless lines that suit every room. Shapes, the Arion can be configured to suit your needs. Combine Arion with our Medium and Big Corners for the perfect sectional. The Arion is great for creating a custom home theater. Cozy up to your favorite show or just relax as the Stressless Arion comes with the patented Glide® and Plus® systems which respond to your bodies slightest movement. This sofa comes with individually reclining seats and and an adjustable headrest option. Complete your room with a one, two, or three seat Arion recliner.